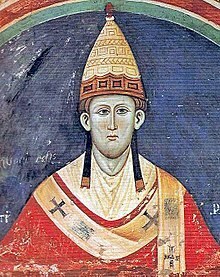 Pope Innocent III (Latin: Innocentius Tertius; 1160 or 1161 – 16 July 1216) was an Italian priest of the Roman Catholic Church and the 177th Pope from 1198 until his death in 1216. Lotario di Conti was born at Anagni in central Italy. His father was Count Trasimund of Segni who was a member of the Conti family. During the short reigns of Pope Lucius III, Pope Urban III, Pope Gregory VIII, and Pope Clement III, he served in the church bureaucracy. In 1190, Clement III raised him to the rank of Cardinal. Cardinal Segni was unanimously elected pope on January 8, 1198; and he took the name of Innocent III. Pope Innocent promoted the theory that the spiritual power of the church was greater than than any king or emperor. Innocent was the first pope to form a Papal state. Innocent III was responsible for starting the Fourth Crusade, the Albigensian Crusade, and the Fifth Crusade. In 1215, Innocent brought together the church's bishops and cardinals in a meeting called the Fourth Lateran Council. ↑ "Agnani", Catholic Encyclopedia; retrieved 2011-11-6. ↑ 3.0 3.1 3.2 3.3 3.4 "Pope Innocent III", Catholic Encyclopedia; retrieved 2011-10-31. ↑ The Penny Cyclopædia of the Society for the Diffusion of Useful Knowledge. C. Knight. 1838. pp. 479–480. ↑ Chisholm, Hugh (1910). The Encyclopedia Britannica: A Dictionary of Arts, Sciences, Literature and General Information. Encyclopedia Britannica Company. pp. 578–579. ↑ Society for the Diffusion of Useful Knowledge (1840). The Penny Cyclopaedia of the Society for the Diffusion of Useful Knowledge: Organ - Pertinax. Knight. p. 198. ↑ Pope Innocent III", Crusades Encyclopedia (2005); retrieved 2011-11-6. "Pope Innocent III". Catholic Encyclopedia. New York: Robert Appleton Company. 1913. This page was last changed on 2 March 2018, at 20:14.